Wood River football coach Kevin Stilling. Smoke canceled last fall’s season-opening prep football game between the Wood River Wolverines and Salmon Savages that had been planned for the Salmon gridiron. But it looks like the skies will be clear Friday, Sept. 6 and the two teams will clash for the first time in 16 years. Opening kickoff for the game between 4A Wood River and 2A Salmon is earlier than normal, at 6 p.m. at Hailey’s Phil Homer Field. Salmon, led by its versatile senior quarterback Jedd Tibbitts, opened its 2013 season at home last Friday with a 56-26 loss to Hamilton, Mt. Tibbitts was the Idaho Statesman’s 2A All-Idaho Second Team quarterback last season. As for Wood River, Stilling and his staff are working with a squad of 25 on the varsity and another 26 on the freshman squad. Many of the players on the freshman team came up through a strong middle school program that went 13-0 over two seasons and outscored opponents 444-32 in those 13 games. The varsity has lost 82 of its 99 (12.4 ppg) points from last season including the graduation of top scorer K.J. Savaria (30 points) and Ian Keys (18 points). Also, senior Gus Conrad (18 points) decided against playing football this season. On offense, Stilling will bring back his rushing-oriented pistol offense that features bootleg and play-action looks. He said fans should expect to see a little more passing this year, possibly 10 to 12 times a game. “With our numbers and our health, we’ll try to eat up a lot of time on offense,” said Stilling, who said he’s already lost five players to injury before the first game. Replacing Tommy Bailey as quarterback is sophomore Alec Nordsieck, a three-sport athlete with a knack for passing. Juniors Hayden Thayer and Champe Kotara are wingbacks, while junior Zach Swanson will carry the payload at fullback. The Wolverine offensive line is strong across the front with junior tackles Taylor Douthit and Parker Bingham, senior guards Cody Richmond and Jackson Toothman, and center Dee Jay McMurdo, whose father D.J. McMurdo was a Hailey star. Wide receivers include sophomore Tyler Price and junior Austin Savaria, with sophomore Gunner Gibson and junior Hagen Barsch lining up as tight ends. Senior Cooper Bailey will return punts and kickoffs and also run the ball on offense. Eron Bates, a senior soccer player with a strong leg, will replace Trevor Brand as the Wolverine placekicker. Wood River’s 5-2 defense underfront “looks more like a 3-4,” Stilling said. Across the defensive line are Bingham, Douthit and Toothman, backed by a linebacking corps with Barsch, Kotara, Gibson, Richmond, Swanson and Toothman. First-team All-Great Basin Conference defensive back Hayden Thayer will team up at safety with Cooper Bailey to form the last line of defense in the secondary. Cornerbacks are Tyler Price and sophomore Chris Lentz. Wood River has its first two games at home, with Buhl arriving Friday, Sept. 13, then goes to Gooding and Kimberly Sept. 20 and Sept. 27. Minico, Twin Falls and Jerome are all coming to Hailey this year. Wood River visits Burley and Canyon Ridge. The Wolverine junior varsity visits Salmon for its first game Thursday, Sept. 5 at 6 p.m.
WOLVERINE NOTES—Wood River will play the Salmon Savages for the first time since 1997, when the Wolverines lost 42-28 at home. In the all-time football series, Salmon leads 11-5 including eight straight wins over Wood River teams. It’s been 25 years since Wood River defeated Salmon, that 34-20 Homecoming triumph coming Oct. 9, 1987 during a 3-6 season for coach John Blackman. Last fall, quarterback Tibbitts guided Salmon to a 6-2 record that included a 20-14 loss at Marsing in the State 2A quarterfinals last Nov. 2. Salmon’s only other loss last season was 26-20 to eventual State 2A runner-up Firth. The Declo Hornets (12-0) captured their first-ever state football championship 22-12 over Firth (11-1) at Pocatello’s Holt Arena. As a sophomore in 2011, Tibbitts’ passing and running accounted for 37 touchdowns, leading Salmon to nine straight wins before a 23-21 State 3A quarterfinal loss to eventual state champion Snake River. One change for coach Ken Miner’s Salmon Savages this year: The graduation of All-State wide receiver Jacob Shively, the team Most Valuable Player who had 36 receptions for 817 yards and 12 TDs last season. Miner said he was Salmon’s best athlete for the 2012 team. Last fall, the Minico Spartans (7-3, 4-1) won their seventh Great Basin title in eight years—but they had to share it this time. Tying for first were Twin Falls (5-5, 4-1) and Jerome (5-4, 4-1). It was the first time in nine seasons since 2004 that Jerome had earned a piece of the Great Basin crown—and it was Jerome’s first winning season since 2009. Minico and Twin Falls emerged from the three-team tiebreaker with Jerome that settled the two Great Basin berths to the State 4A football playoffs. Minico earned the top seed and lost 28-14 at home to Skyview of Nampa. Skyview went on to take Blackfoot to the limit before falling 34-27 in the semi-finals. Blackfoot (11-1) won its second straight State 4A title and fourth in six years 48-19 over Middleton last Nov. 16 in Boise. Twin Falls, having posted its first win over Minico since 2005 during last fall’s league play, came on strong after starting the season 1-4. But the Bruins bowed out of the playoffs 36-7 at Middleton. Canyon Ridge (3-6, 2-3) earned narrow wins over Burley and Wood River to place fourth in the league, while the Wolverines (2-6, 1-4) were fifth and Burley (3-6, 0-5) was sixth. Besides Stilling, those returning as the head coaches in the Great Basin are 18th-year Minico mentor Tim Perrigot along with seventh-year Twin Falls coach Allyn Reynolds. In their second seasons at the helm are Sid Gambles of Jerome, Jed Thomas of Burley and Justin Alsterlund of Canyon Ridge. Jerome (21-14 at home over Mountain Home), Burley (34-0 at Filer) and Minico (27-10 over Park City, Utah Saturday at Pocatello’s Holt Arena) all won their openers last weekend, while Canyon Ridge lost 42-22 at Columbia. Here are Wood River’s 2013 varsity and freshman rosters. Position symbols are Offensive and Defensive Lines (OL/DL), Wingback (W), Fullback (FB), Defensive Back (DB), Safety (S), Quarterback (QB), Linebacker (LB), Wide Receiver (WR), Tight End (TE) and Kicker (K). 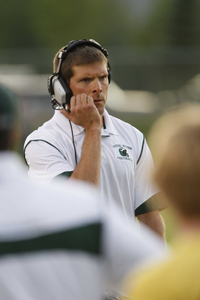 Head coach—Offensive and Defensive Coordinator Kevin Stilling (5th year, 14-20). Assistant coaches—Pete Naumes, J.C. Nemecek, Andy Miles, Zeke Herron, Rhett Jones, Matt Nelson, Jeff Loomis, Baba Street, Daniel Turner, Braxton Parish, Kyle Carr, Boomer Gibson and Kerry Bingham. Seniors (8)—Cooper Bailey (W/S), Cody Richmond (OL/LB), Jon Reigle (OL/DL), Jackson Toothman (OL/DL and LB), Beau Boss (OL/DL), Brian Trejo (OL/DL) and Eron Bates (K). As his senior project, Quinn Guthrie will help with the freshmen and see how coaching actually works. Juniors (10)—Hayden Thayer (W/S), Hagen Barsch (TE/LB), Parker Bingham (OL/LB), Taylor Douthit (OL/LB), Champe Kotara (W and FB/LB), Zach Swanson (FB/LB), Austin Savaria (WR and W/DB), Austin Krenz (WR/S), Isaac Easterday (W/S) and Aramys Gallegos (WR/DB). Sophomores (7)—Gunner Gibson (TE/LB), Alec Nordsieck (QB/DB), Dee Jay McMurdo (OL/DL), Chris Lentz (W/DB), Tyler Price (WR and QB/DB), Justin Miller (OL/LB) and Omar Salamanca (OL/DL). Head coach—Rhett Jones. Assistant coaches—Matt Nelson, Zeke Herron, Kyle Carr, Braxton Parish, Kerry Bingham. Freshmen (26)—Stephen Balcos, Bodie Bennett, Brendan Bingham, Jens Blackman, Jacob Bulotti, Marc Cardona, Tor Dalzell, Owen Gifford, Hans Heaphy, Alec Higley, Connor Lohrke, Brock Mary, Caleb Morgan, Antonio Munoz, Zach Nelson, Ashton Owens, Jeron Peavey, Donovan Reese, Benjamin Romero, Cade Schott, Travis Swanson, Evan Telford, Jubal Toothman, Jesse Vercelli, Beck Vontver and Sawyer Hall.